Bed and breakfast in Newby Bridge. Newby Bridge is a small settlement with two hotels, clustered around the impressive bridge which gave the village its name. The five-arched bridge that spans the picturesque River Leven is an important river crossing that was built in 1651, when the older timber construction was replaced. Situated at the foot of the Lake District, Newby Bridge is set among beautiful Lakeland farmland within easy reach of Lake Windermere. It is an excellent base from which you can explore Windermere and the south lakes. Also see Newby Bridge & Newby Bridge attractions. If you are in the right town but cannot find the accommodation you want on this page, you might consider Newby Bridge hotels & self catering accommodation in Newby Bridge. On the shores of Lake Windermere, Newby Bridge Hotel has a fine restaurant, a swimming pool and a gym. The hotel offers free Wi-Fi and free private parking. The elegant rooms at Newby Bridge have satellite TV, radios and tea/coffee facilities. Some rooms feature four-poster beds or spa baths. In 5 acres of grounds, Newby Bridge Hotel has leisure facilities including a steam room and a jacuzzi. Overlooking Mediterranean gardens, the Newby Bridge dining room offers a menu using fresh, produce from the hotel's own garden. The Huntsman Inn is a traditional bar, and there are log fires. On the shores of Lake Windermere. In beautiful landscaped gardens, Beech Hill has a 2 AA Rosette restaurant and an indoor heated pool. Some rooms feature spa baths, four-poster beds or garden terraces. Many of the elegant rooms at the Beech Hill have partial lake views, and each room has satellite TV and tea/coffee facilities. Some rooms have balconies or patio doors. With lake views, Burlington's Restaurant serves a modern British menu of award-winning food. Griffin Bar and Lounge serves afternoon tea and light snacks, and features log fires and a large terrace. Beech Hill Hotel in the Lake District has free secure parking and free Wi-Fi in the public areas. On the shores of Lake Windermere, river cruises and walking routes are within easy reach. About 4 miles from Newby Bridge. 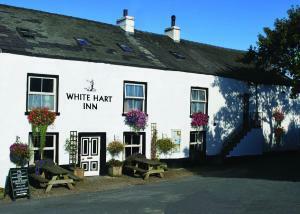 In the Lake District National Park, the White Hart is a 17th-century inn, in the village of Bouth. There is free private parking, and traditional Cumbrian breakfasts are provided. The White Hart has homely rooms with tea/coffee facilities and original oak beams. Some rooms have woodland or countryside views. Full of character, the cosy bar offers a large selection of ales and malt whiskies. There is a traditional food menu and an outside terrace. Halfway between Lake Windermere and Coniston Water, White Hart Inn is a 20-minute walk from magnificent views of the Rusland Valley. Local leisure pursuits include climbing, fishing or cycling. For bed and breakfast accommodation in other areas near to Newby Bridge see bed and breakfast in Ulverston & bed and breakfast in Barrow in Furness.